For those of you who are fans of or have heard about "baking" your concealer with banana powder to make your under eye area brighter and even, you'll love the new OLEHENRIKSEN Banana Bright Eye Creme. OLEHENRIKSEN Banana Bright Eye Creme was inspired by banana powder and this yellow formula contains special pigments to instantly brighten and color-correct the eye area. It provides the perfect amount of moisture and works as a base for concealer as well as brightening the eye area over time. OLEHENRIKSEN Banana Bright Eye Creme supports natural collagen, firms and deeply hydrates the eye area, with a lightweight feel. Formulated with powerful vitamin C, it provides real results you can see instantly. 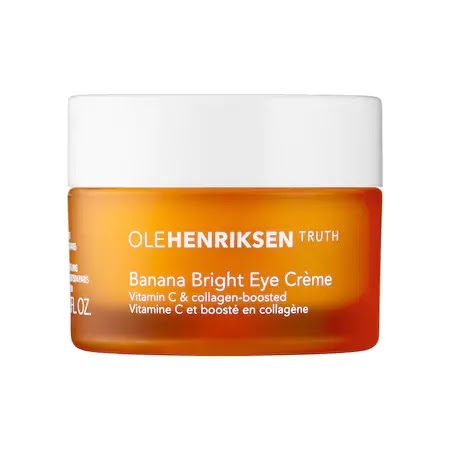 I loved the texture and extreme hydration of OLEHENRIKSEN Banana Bright Eye Creme. It was moisturizing without being heavy, sticky or greasy. Just a pea sized amount was all I needed for both eyes, and a little went a long way and melted into my skin instantly. I used it in the morning and loved the instant eye brightening effect. Most days I would still add some concealer, but depending on your level of under eye darkness, you might not need any concealer after using OLEHENRIKSEN Banana Bright Eye Creme..